Do you feel like your yard is missing something? You want to be able to enjoy being outside and have something fun for everyone to do. An inground pool could be exactly what is missing. A swimming pool is fun for everyone, and it will make your yard fun again. You will enjoy spending time outside enjoying all the benefits of a beautiful new pool. 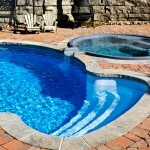 An inground pool will add class and style to your property. Pools will increase your property value by quite a bit. Not only are swimming pools desirable to people, but they really are beautiful. There is nothing more stunning than serene, clear water. You can also add stamped concrete or tile around your pool to give it a finished look. It also adds a wonderful style element to the pool. You can choose from many different designs to get the perfect look. You can also add big rocks, water features, waterfalls, and foliage around the pool to create your own backyard oasis. You can build a beautiful patio or even an outdoor fire pit to create the perfect outdoor space for entertaining and gatherings. If you want to learn more about an inground pool for your home, contact us today at Lake Norman Signature Pools & Patios. We provide our customers with experienced and professional swimming pool design and installation and can help you figure out exactly what type of pool will work for the space you have and how to incorporate your vision and style for the project. We can help make your dreams of owning a backyard swimming pool a reality. We have fast turnaround times and can have your pool installed and ready for you to use before you know it!